Amylee was born in 1978 in Nimes in the South of France. A region where the colour rises in the light. Early on, she falls in love drawing and even painting. Determined, she will follow a path that will allow her to express and stimulate her creativity. 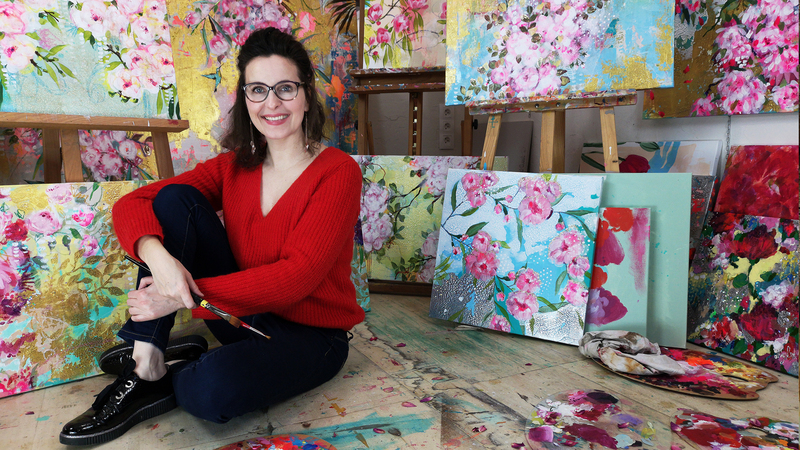 From her artistic studies in correlation to her jobs, but also now as a painter, Amylee sees life in colours! The shade is strong, radiant but also soothing and remains at the center of her work. In 2008, she decides to follow her deep desire: to paint full time. Amylee then uses all her skills and her influences together to paint artworks that will be light sources, vibrations, emotions. She finally chose acrylic paint, a technique that makes the art customers brighten as the varnish does for the paint. Pencils and pens remain dedicated to sketches. 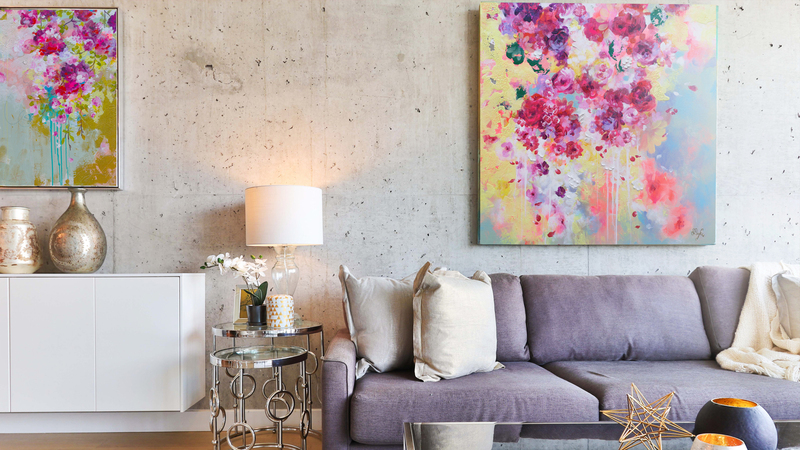 In her portfolio, mainly figurative at the beginning of her career, Amylee Paris' paintings gradually give way to a floral abstraction, an aesthetic around matter and time. 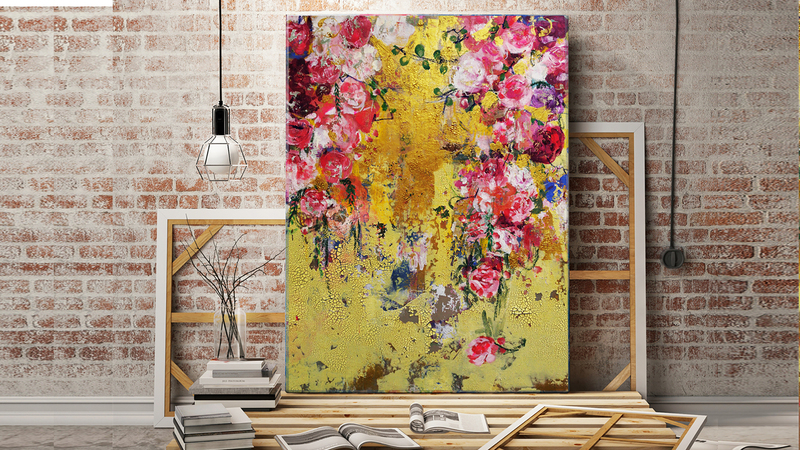 Flowers and petals are closely related to possible paint accidents. Sometimes a portrait springs from this floral cycle, sometimes the vegetation remains the only decorative element. The unfolded palette is faded, glittering, textured, dotted with neon lights, perhaps in memory of the artist's creative process in her multicoloured years. Her artwork revolves around pictorial phases but 2019 will impose to her painting an emotional imprint characteristic, a stronger graphical signature. Inspired by the philosophy of Kintsugi and the technique of peeling, Amylee is interested in the experience of pictorial material. Cracking no longer means tearing, but the beginning of another cycle and a continuity. It is no longer a question of hiding the imperfections, but of putting them forward. The use of gold then sublimates this peeled, worn paint that worked. Vegetation symbolizes change, victory over the torments of life. Amylee is inspired by the masters of figurative painting. Graphic codes of Klimt and Mucha are glimpsed in many of her paintings. We can also detect the influence of Alma-Tadema, Monet, Morisot. She is very attracted to the Pop Art, particularly the one by Roy Lichtenstein and urban artists like Ernest Pignon-Ernest, Eduardo Kobra, David Walker. She also loves these patterns deployed on fabrics that can be seen to Christian Lacroix, Manish Arora or Yulia Yanina catwalk. Amylee's paintings are great travelers as they travel miles across Europe, the US or Asia for the delight of collectors. This phenomenon has been quickened due to representative galleries which exhibit her paintings internationally but also to the global showcase offered by the web. By a real need to express herself "the expression in all its forms", Amylee created a blog in 2009 to share her experience and expertise as a painter. An online magazine amylee.fr becomes the rendez vous for a large great community! After Nîmes, Toulouse, Paris and London, Amylee lives now in the center of France. Nevertheless, she keeps being active all around the world where she still works around artistic events.